Wednesday, October 23rd, 2013 | Author: Bunco Betty! Bunco is a great way to get out of the house and socialize with friends. It is also exciting that there is a chance to win a prize! In my group we have many ways to win both cash and non-cash prizes. I have played with two different groups in the last eight years. My former group had a $11 pay-in for the cash prizes and the host provided one non-cash prize and another was provided by the person who received the prize last month. When I started my own Bunco group I dropped the cash pay-in to $5. We typically play with 19-24 people so the cash prizes are still decent since we have more than the usual 12 players. For non-cash prizes I try to purchase things that go along with the monthly theme. I also try to keep the prizes between $8-$10. For our upcoming Animal Print themed Bunco in November I found really cute animal print pens and pads of paper at a local craft store. I also purchased adorable zebra and leopard print bags and tissue paper to keep with the theme. To create even more fun ways to leave with a prize, I print the Bunco scorecards on different colored paper. Players who have that months color receive a small prize. For our animal print Bunco, these cute napkin and plate sets will be the scorecard prizes. 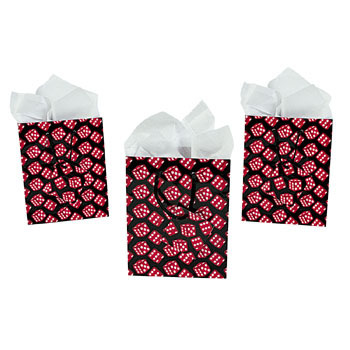 Thinking ahead, for our Christmas White Elephant Bunco this year I will be using these adorable bags. Is your group creative with prizes? If so let me know on The Bunco Game Shop’s Facebook Page. I always love new ideas to make Bunco even more fun!